Recently I had to write some SQL queries in a quite advanced application (Banshee ). 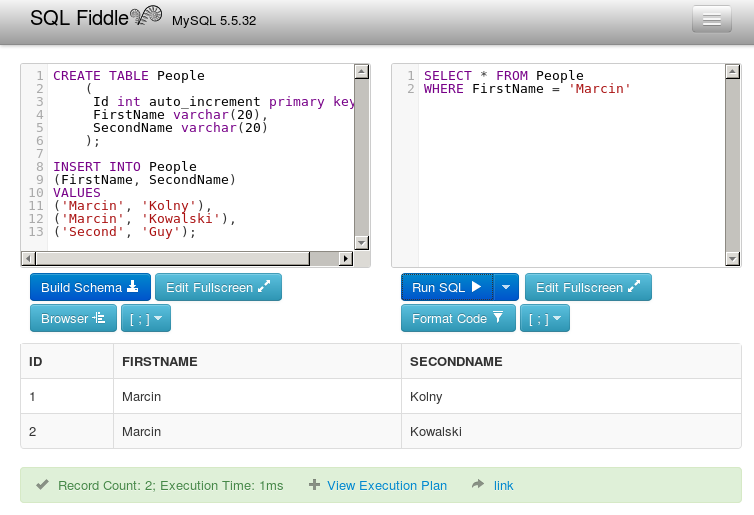 I'm not an expert in SQL, so I had to work through trial and error. But recompilation and restart application every time, when I changed something, was very time consuming. Unfortunately, I didn't use my own computer, and I hadn't installed(and I wasn't able to install) any SQLite shell. I started to looking for web interface for SQLite database. One of the first result in Google was sqlfiddle  page. At first sight website looks very simple. And in reality - it is. On the left side you have to write DDL statements, and on the right side, you may use created schema by sending some queries. You may also generate link to your case, and paste id e.g. in some forum or irc channel.